National award winning filmmaker Rakeysh Omprakash Mehra hosted a special screening for the cast and crew of the film. Apart from Rakeysh Omprakash Mehra and his wife Bharti Mehra, the screening was attended by Anjali Patil, Om Kanojia, Rashika Aghashe, and Mohammed Zeeshan Ayyub. The event was also graced by the renowned filmmaker Vishal Bharadwaj. The film which aims at bringing a change in our society has been appreciated by eminent personalities like Sadhguru, Milkha Singh and Sunil Gavaskar. Mere Pyare Prime Minister presents the bond between a son and mother building the essense of the story. The film traces the journey of Kanhu who struggles to reach the Prime Minister for his mother who met with an ugly heartbreaking incident due to unavailability of toilets. Mere Pyare Prime Minister delivers a social message with an emotional narrative highlighting the dark shades of the city and yet again Rakeysh Omprakash Mehra who has earlier helmed Rang De Basanti, Delhi-6, amongst others is all set to present Mere Pyare Prime Minister. 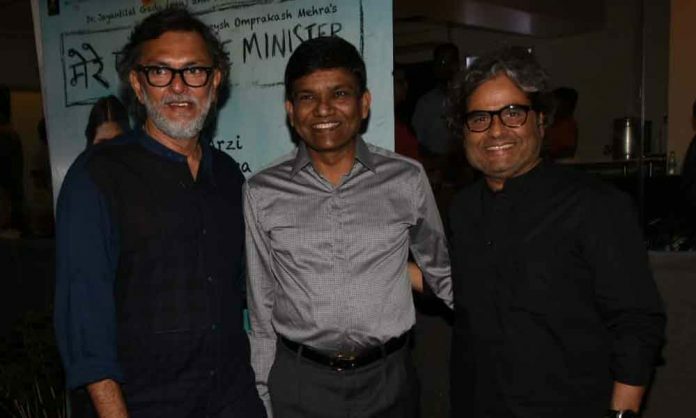 Dr. Jayantilal Gada (Pen) and PVR Cinemas present, Rakeysh Omprakash Mehra’s directorial Mere Pyare Prime Minister is all set to release on 15th March 2019.